GoPro HERO5: This isn't working with HERO5 footage in Studio v.2.5.9.3372. We're waiting on an update to Studio that should make it compatible with the HERO5. 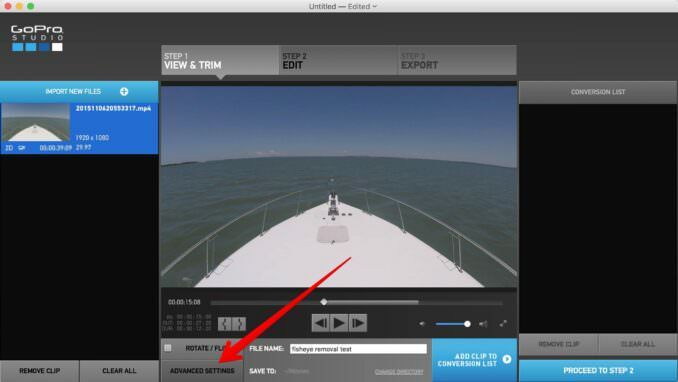 In the meantime, GoPro Support recommends shooting in the new Linear Mode. 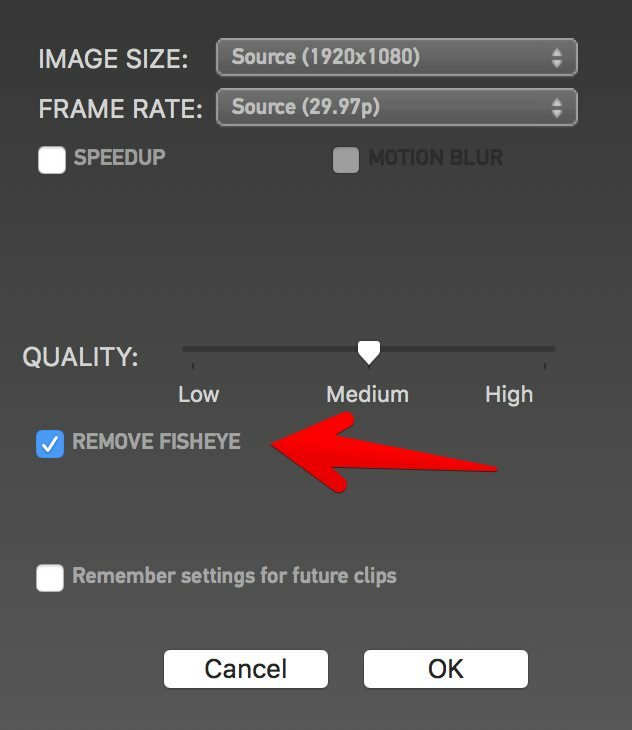 I've written about how to remove the fisheye effect from GoPro photos before. But it doesn't work the same way with GoPro videos. To remove that distinctive ultra-wide-angle look from video footage, the best and quickest way us to use the free GoPro Studio app. 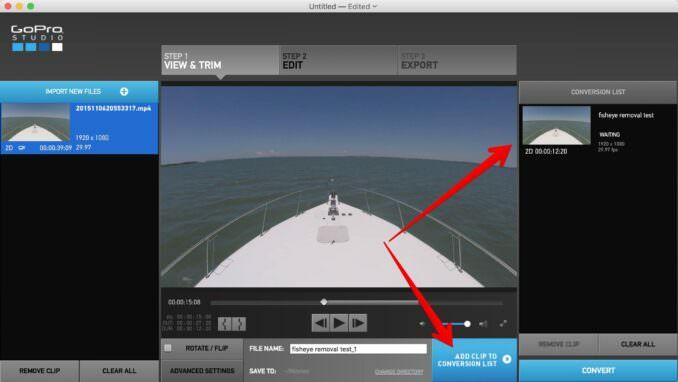 There's no real trick, as such--it's a feature built into GoPro Studio. But it doesn't come in the part of the process you'd necessarily expect it to. That is, rather than doing it in the editing screen where you adjust colors and tones and audio and titles, etc, you do it in the first step of preparing the video file for editing. In the GoPro Studio workflow, you apply it when going from Step 1 to Step 2. So when you're first opening the file in GoPro Studio, click on the Advanced Settings button at the bottom. And then choose the Remove Fisheye option. You won't see any difference in the version you see in the main part of this screen--it doesn't show up in the preview panel. Then click on the Add Clip to Conversion List button, and you'll see it appear in the right panel. You can, if you like, add more than one version to the conversion list, one with the original fisheye and one without. Once you run the conversion list and move to Step 2, the editing part of the workflow, you'll get the converted non-fisheye version amongst your clips, and you can now see the results. And now you can continue on with your editing just as you normally would or export the clips to continue editing in something else like Final Cut Pro. Here's the before/after footage. The most obvious result is that the horizon is straightened. There's also some of the frame lost on the side as the field of view narrows a bit. It's worth noting that this only works with GoPro footage that hasn't been otherwise edited. This isn't the only way to correct the fisheye in GoPro footage. If you're using Final Cut Pro or Adobe Premiere, there are wide-angle distortion correction plugins that do a very good job, like this one. And you can do it in Photoshop, if you're so inclined, by using third-party tools available through Adobe Exchange. This also only works with GoPro video footage. The option isn't available when working with still photos in GoPro Studio. So for still photos you'll need to use something else--here's how to do it in Lightroom. There are also some third-party alternatives like this premium plugin (ie. costs money) for Final Cut X from the folks at Crumblepop. There's no way to do it in the camera because the HERO (2018) doesn't have the Linear field of view as an option. You can, however, remove it, or at least greatly reduce it, using computer software. There are several options outlined above in this post for both videos and photos. i want to remove fisheye effect from the GoPro Hero 2018. can you help me? So, you guys need to get on your stuff. GoPro Hero5 Black produces videos, but GoPro Studio can't remove fisheye on Hero5 videos. Waiting for an update?! How about an update, then selling the product. I agree it needs an update, but I'm not GoPro and have no role in developing GoPro Studio. What I have noticed is the the remove fisheye feature in GoPro Studio actually cut off the ends of the video, so that parts of the left and right side of the video is missing. Is there a fix for this? No, it's unfortunately the comprise for narrowing the field of view. I have HERO5 footage and the remove fisheye setting in ProPro Studio is not working for me. It works on footage I recorded with me HERO3+. Please let us know if you have any issues removing fisheye on your HERO5 footage using GoPro Studio. I've just tested it and am seeing the same issue. It's working normally for HERO4 Black footage but not having any effect at all with HERO5 Black footage shot with same settings on Wide FOV. Looks like Studio needs to be updated to recognize the HERO5—I'm using Studio v.2.5.9.3372 on Mac. I have GoPro Support Case 02784169 opened and I will let them know that you are having the same issue. Great--thanks. Would love to hear if/when you get a fix or resolution. Studio has not received an update since the HERO5 release which is why this function currently is not working. For the time being please stick with "Linear" FOV as a workaround. We will let you know once there is a new update with our Studio. Thanks for the update, Tony. Hope you don't mind that I took the liberty of editing your comment to take out the identifying info. I don't have a GroPro yet but am looking at the Hero 5. My ? is being a still photographer using Lightroom will I be able to edit/remove the wide/fisheye view and also do other edits? What about using Adobe Elements (12 I think) Premire (again I think its for video editing). My main concern is getting rid of the wide angle perspective. I don't want lessen the size of subjects. I will use this on my motorcycle riding in the mountains (Blue Ridge Pkwy) and want the viewer to get a good feel of the speed of the motorcycle but also the view from a "normal" lens. I plan to update this post later today or tomorrow with some examples shot with a HERO5 Black.